Oops - we don't appear to have a video for the GT-2500. 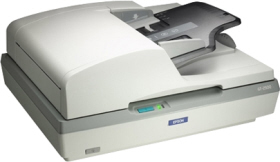 The Epson GT-2500 is the ultimate business scanner - its very latest technology allows you to scan efficiently using the 50 page Automatic Document Feeder, making it the ideal solution for professional archiving and document management. Reliable and robust, the Epson GT-2500 scans up to 27ppm, quickly converting proposals, quotes, letters, faxes and more into electronic files to share or archive. Automatic duplex functionality reduces manual intervention by scanning both sides in a single process, significantly reducing the time taken to scan documents.